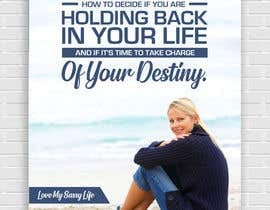 The title of this PDF is "How to Decide If You are Holding Back In Your Life and If It's Time to Take Charge of Your Destiny" This is an 8 1/2 x 11 format. My business is Love My Sassy Life and the website is [login to view URL] I'm looking to find someone to build a relationship with for future projects. The demo of the market are women 40+, looking to improve their lives. (very generally speaking) It's important that they can see themselves in the image or else they won't want to even opt in to get the PDF. Please let me know if you have any questions. *Any images must be royalty free and available for commercial use. I'll post feedback on the public comments section so that everyone can benefit from my feedback as this develops. Thank you very much for your efforts. Wow, this has been a process, and a learning one for me too. Thank you everyone for your submissions. I've narrowed it down to four for the last day so that you can see what has really stood out for me. Do you want the final product to be a mock-up or do you just want the picture? Do you prefer a light font or something more stable and visible? I noticed that the mockup on your website looks pretty small and that the title is kind of hard to read, maybe bold lettering is better at actually drawing your clients attention. This is just a suggestion, of course, I just want to know more about what you had in mind. Also, if you like them enough, please provide feedback for entries #45 - #49, so that I can improve them if need be. Thank you in advance. Hi, I wouldn't use the one on my website as a guideline, it's crap (I did it a while ago) and is really holding space and that is being replaced. The font needs to be easy to read and show the emphasis of the message, the image needs to be something that draws the women in and enables them to picture themselves in that state. I do request a full mock up to see how it's all together. I appreciate your questions. Thank you. Hi There, do you have any color choice in design? Not specifically. But it shouldn't be too dark and they should be balanced. I don't want the pink from the website to be a primary color used. As we are getting near the end are there any questions I can answer? 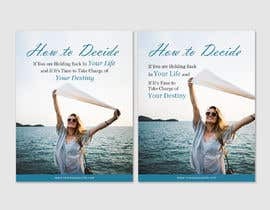 For all of these I think the focus in the font should not be on How to Decide but needs to be more on holding back in life and choosing own destiny - the substance of the PDF. For skimmers, they are going to see those three words and move on. The focus of the topic is what needs to grab them. Thank you. #37, #38 , #39: I like how clean these look and how a woman could easily picture herself in this space. 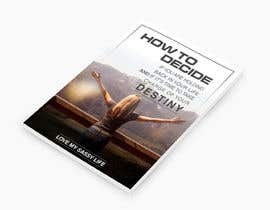 I think the focus on the title needs to be more on holding back in life and choosing own destiny rather than How to Decide. For skimmers, they are going to see those three words and move on. The focus of the topic is what needs to grab them. #26: The imagery here is nice, but the woman is too young. The women in my market, 40+ will look at her legs and won't be able to see themselves as her because they will get stuck on "when they were that young". #33: Thank you Md A for your multiple submissions, with this one the image will not work. She appears to be crying and the image needs to be hopeful. #32: I appreciate your efforts on variations of the cover. I don't like the image after the word Destiny - I'm spending too much time trying to figure out what that is rather than on the topic of the PDF. #30: I don't like the feel of the font, it has a sharp, hard feel to it with the color around the writing. It's the same with #5 and #6. I images allow for someone to see themselves, but the font is off. #28, #29: I don't like the color washing of the blue and pink in these. The imagery makes me feel sad when I look at it, not hopeful. #22, #23, #24: thank you for the variations. #22 appears to be a school girl from behind so probably not contemplating this type of decision at this time in her life. I prefer#23 to #24 because it's not as dark. #11, #20, #21: The name of my company is Love My Sassy Life and this is what should replace LoveMySassy Thank you for different variations on the font of the title. 12: I like the formatting of the font, and even that we don't see her face because that makes it easy for any woman to picture herself in this position. But the image is a bit busy and distracting. My eye is drawn to the tree each and every time I look at this. #19: I think a less spiritual looking picture would be better. It can already be a heavy subject for some and this image can make it look even heavier. The font for How to Decide is hard to read. Studies show that if someone has to work even a little to read the font they will move on to something else. #14, #15, #16 and #17 my first reaction was to lean back to look at them because the font was too overpowering. In #15 and #18 an image of a man is use, bu the market is women. In #17 it looks as if an image of a child is being used. #9: I like the font and way you presented the message. You wouldn't know this, because I didn't mention this before, but the work within the PDF is more solitary a group effort so this image wouldn't work. But it has me thinking.... thank you. #11: I like how she is clearly pondering while looking off into the distance. Also, because you can't see her face, it's easy for someone to picture themselves as her. The company name at the bottom should be Love My Sassy Life. I really appreciate the efforts by everyone, thank you. #8: I think the image it too much for the brain to focus on and therefore would have someone moving on to something else. With the focus on the word Back first, it would be a little confusing for the skimmers and the clouds don't seem to fit with the message - that is more of a spiritual thing. #10: I like these. I would like to Love My Sassy Life at the bottom please somewhere. I like how in each of them I think someone can picture themselves. #5: There does need to be some company branding on the cover please, just not as a focal point. I like that you didn't necessarily grab the pink and blue from the website. I do think a woman a little older.... a little, would be better. She doesn't seem old enough to be struggling with her life's direction and the women looking at this need to be able to see themselves in the picture. Actually, it might not be her age as much as how put together she looks. Thanks! #6: I like how you did NOT my company branding the focus of the cover because it shouldn't be, it's not about the company. Thank you. I don't think it needs the larger logo under the How to Decide. The image of the woman does seem a bit large to me, but I do think this is heading in the right direction. #7: The people reading this need to be able to see themselves in the image in order to want to opt in and exchange their email address for it - because it's such a personal subject. Therefore I believe an image for this topic would be needed. #4: The image doesn't tie in with the subject and the color of the font doesn't need to be pink because that is on my site. It doesn't fit with the image. The people reading this need to be able to see themselves in the image in order to want to opt in and exchange their email address for it. #3: The image doesn't tie in with the subject and the color of the font doesn't need to be pink because that is on my site. It doesn't fit with the image. The people reading this need to be able to see themselves in the image in order to want to opt in and exchange their email address for it. Can you tell the PDF format size? #2 is not going to work, it is very basic a standard font slapped onto a black background on top of a woman. Nothing in this makes me want to read what is behind the cover the company information isn't on there anywhere either. This is a nice image of the woman but I think it is more seductive than that of a woman pondering her life and her future. I'm ready to work on your project, is it possible to describe exactly what are you looking for?